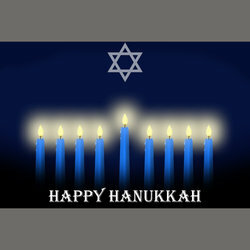 Hanukkah, which is Hebrew for “dedication,” is the Festival of Lights. This year, it is celebrated for eight days beginning on December 2. The holiday commemorates the victory of the Maccabees over the Syrian Greek army, and the subsequent miracle of rededicating the Holy Temple in Jerusalem and restoring its menorah, or lamp. The miracle of Hanukkah is that only one vial of oil was found with just enough oil to illuminate the Temple lamp for one day, and yet it lasted for eight full days. Local 100 extends our best wishes for a wonderful holiday to our Jewish Brothers and Sisters on this happy occasion.